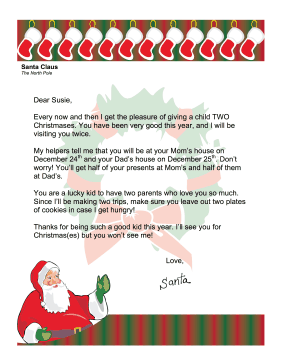 This letter from Santa addresses the issue of a child having divorced parents and two Christmases. Every now and then I get the pleasure of giving a child TWO Christmases. You have been very good this year, and I will be visiting you twice. My helpers tell me that you will be at your Mom's house on December 24th and your Dad's house on December 25th. Don't worry! You'll get half of your presents at Mom's and half of them at Dad's. You are a lucky kid to have two parents who love you so much. Since I'll be making two trips, make sure you leave out two plates of cookies in case I get hungry! Thanks for being such a good kid this year. I'll see you for Christmas(es) but you won't see me!